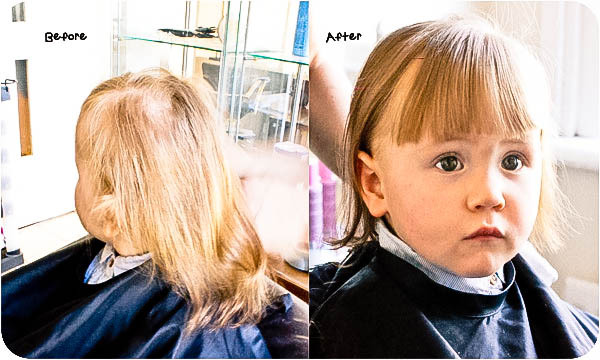 Today at the age of 15 months we had to give in and take Isabelle for her very first haircut. It wasnt something that I had imagined that we would have to do so early but as you can see from the picture we couldn’t put it off any longer. The poor girl had a fringe past her eyes and even though she never seemed bothered by it we made the decision to have it trimmed. With the plan to just cut her fringe we took her to a lovely hairdressers and since Isabelle was so well behaved the hairdresser even managed to give all her hair a quick trim. From the pictures it does look like a lot has been taken off but I can assure you the length in the back is still there….I would have been devestated if it wasn’t as I do love her hair. Oh bless her, big girl now! She’s got a beautiful little face!